Crop circles dating back to the Second World War are “proof the phenomenon is no modern hoax”, according to a story published by The Huffington Post. Research by an Australian archaeologist, using images from Google Earth’s new 1945 overlay, has found evidence of circles in English fields long before the recent craze linking them with aliens and UFOs. The photographs were taken towards the end of WW2 by the RAF. But I have discovered that earlier in the war similar circles and other suspicious ground marks were the subject of a secret investigation by agents working for the British security service, MI5. Unusual markings in crops – including simple swirled circles – turn up in written records dating back as far as the 17th century. Indeed it was a well-known account of circles that appeared following a gale near Guildford, published by the journal Nature in 1880, that prompted Jeffery’s research in the first place. But none of the simple circles referred to in these accounts, or the ones identified in the WW2 aerial photographs, resemble the elaborate formations and pictograms that have become characteristic of the modern circles phenomenon. As the Circlemakers and other circle-making groups have demonstrated beyond reasonable doubt, it is not necessary to invoke extra-terrestrials or spiritual forces to explain these phenomena. Human beings are quite capable of producing striking and beautiful landscape art. The urge to attribute crop circles to mysterious or supernatural forces is nothing new and is found in the eye of the beholder. 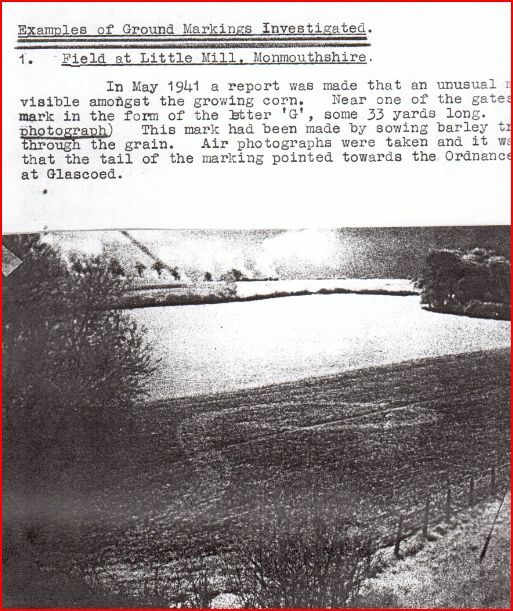 The appearance of strange markings in fields in wartime England was naturally regarded at that time as possible evidence of enemy rather than alien activity, as the former Top Secret file assembled by the British Security Service MI5 proves. The illustrated dossier, held by The National Archives at Kew, contains details of covert investigations into activities by “suspected fifth column activities” during the invasion scare of 1940-41. After the fall of France to the Nazis, rumours spread about the activities of German spies who were said to be active in the British countryside preparing for the invasion ordered by Hitler (Operation Sealion). Many people, including some MI5 officers, felt this was a real possibility as it was common knowledge that fifth columnists had played an important role in the invasions of France and Belgium. Signal lights and ground markings had been used on the continent to guide Axis bombers and parachutists to their targets. So MI5 feared “such ground markings might be the cutting of cornfields into guiding marks for [German] aircraft” via coded messages that could only be seen from the air. They asked RAF and Royal Navy pilots to report sightings of any unusual ground markings for investigation. 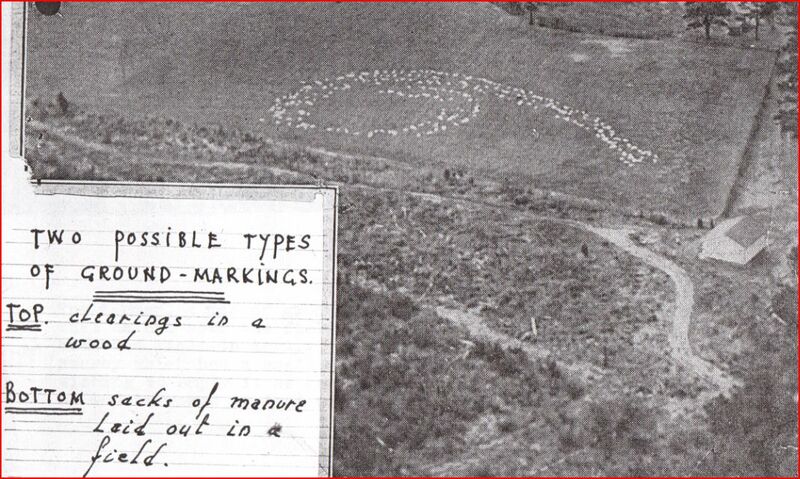 In May 1941 one such “unusual mark”, 33 yards long in the form of the letter “G” was spotted by the RAF in a field of growing corn in South Wales [see photograph from MI5 file, below]. From the air it appeared the tail of the marking pointed towards the Royal Ordnance Factory at Glascoed and MI5 were called in to investigate. In October 1943 a RAF aircraft spotted a circle in a field near Staplehurst in Kent, with the word ‘Marden’ incribed within it. MI5 agents discovered the field had been used before the war as an emergency landing ground for Imperial Airways. All the cases investigated by MI5 during WW2 had innocent explanations. In one case a circular white swirl in a growing crops, photographed from the air, was found to be caused by sacks of manure laid out in the field! I suspect that many of the simple circles and other ground markings (including one in the form of a triangle) identified in the Google Earth sample could be ploughed out archaeological features, such as prehistoric round barrows. Nevertheless, there is no doubt that unusual swirled circles have appeared in fields of crops across southern England for centuries. But until the last two decades of the 20th century no one seriously suggested they could be the work of aliens. Before that time farmers, on whose land they appeared tended to attribute them to natural causes such as whirlwinds or trampling by animals. Naturally, the sudden and uncanny appearance of swirled rings overnight in the middle of virgin crops led some to attribute them to supernatural forces. This entry was posted in Uncategorized and tagged crop circles, fifth columnists, Glascoed, Google Earth, Greg Jefferys, MI5, Nature (journal), Operation Sealion, pictograms, RAF, Second World War, Security Service, The National Archives, University of Tasmania. Bookmark the permalink. Evidently that image got around!